Shower curtain is beautiful! Accents my bathroom colors very well. I am pleased with the shower curtain. 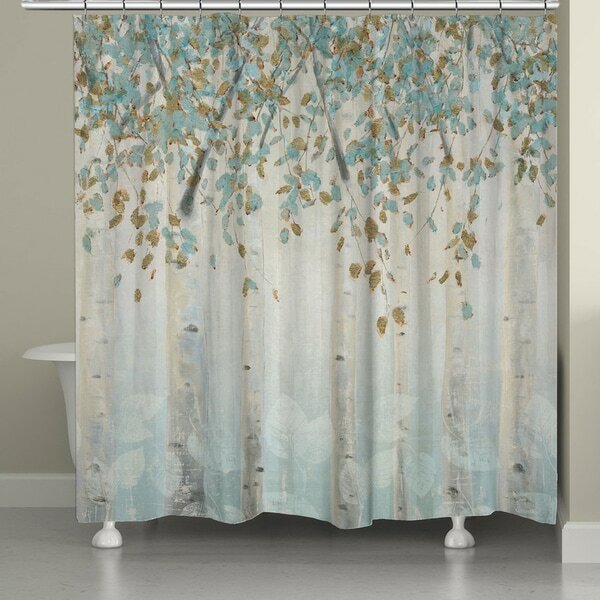 A rich, vintage-style complement to any bathroom decor, the Whimsical Forest shower curtain by Laural Home is made from premium polyester fabric and features a unique blue and gold birch tree and leaf pattern. Digitally printed for crisp and vibrant colors, this excellent curtain is sure to add a touch of fresh character to any bathroom. Beautiful curtain. Colors very vibrant more so than in picture. I have to admit that I have never spent this much on a shower curtain. Worth every penny. So happy I went for it. It is gorgeous!! I love this shower curtain. I think the colors are great with super accent colors to add to my bathroom decor. I really like the colors/pattern of this shower curtain. It was quite pricey but the colors were so unique and just what I wanted. It is very good quality so I feel better about the price with that. Very pretty and is the focal point of the room! This is just beautiful! Perfect color for my bathroom. It looks different in the pictures, more yellow, but it's bright blue in person. Not as muted like it shows in the pics. I am returning it because of the color. I LOVE this curtain! The design scene is very calming and the trees look great against my new barn wood floor. Colors are perfect! The shower curtain I received did not look like the picture. In the picture, it looks like there is some yellow and blue, on the piece I received there was also red. Thinking about returning it and very disappointed. Cheap- fabric not good quality and looks cheap. Colors are very true. I'm very happy with my purchase. It’s pretty , I love paintings and this shower curtain looks like one but I wish it was more opaque and in your face . I feel like the pastel colors are bland and dull. It looks less lively in person . "is there gray in the curtain? or just browns?" there is gray, brown, different shades of aqua or sea foam. I love the fabric, love the look, love the color! I have never paid this much for a shower curtain, but knew from the moment that I saw it it was perfect! "it says blue is this more of a blue green, teal or sea mist color kind of blue"
Thank you I thought it might be. "Is the curtain 71" long or 74" long?" This is approximately 74 inches long. These beautiful curtains were more than I budgeted for. I have a free standing tub/shower and need 3 panels, but I absolutely love them. I liked the design and wanted a curtain that is light colored. to brighten up my bathroom! !